| What to expect as a newly graduated graphic designer. What to expect as a newly graduated graphic designer. Ok, you’ve just graduated, armed with a portfolio, some knowledge and new clothes to boot. So…. now what? what happens now? how do you get a job? who do you talk to? how will my new bosses treat me? Good questions! As newly graduated designers/coders/web developers, we’ve all sat down after the rush of school is over and say, “….. Where do I begin?….anyone? help!” Everyone freaks out a little, you are not alone it’s perfectly normal. So, what I want to talk about is my experience when I was newly graduated designer and being a green horn (brand new on the job). Now is the time to get your online presence started, if you all ready haven’t start now, most employers want to see your portfolio digitally, it’s much easier that way. But, it’s always good to have both, digital and hard copy. If you don’t know much about web design, the best place to start is a platform such as: WordPress, Joomla, Drupal or even Blogger. Those platforms have theme’s that have all the HTML/CSS customizing done for you. Great if your new to HTML editing. Be sure that your web site runs smoothly on Mac and PC, we Mac people forget about PC issues with online coding. My first website was completely made on Safari, I finally clued in to check it out on PC. Boy, I was glad I did. Saved a lot of embarrassment. Find out all the companies in your city that have a prominent graphic/web/coding department. This can take some time, especially if your in places like NYC, LA, London… big cities. So, narrow down your proximity to places close to you. Write down all their names, contact info and see if you can find email addresses to those in charge. I did this for my city, I had a few pages worth of notes and somewhere to start. Ask your school for leads! Many employers will call up and ask if they have anyone who could help with design work. They understand that they’re hiring people fresh out of school and that the turn over time for project might be a bit slower (or at least they should understand). The big thing is when you’re fresh out of school, many of these employers looking for students through schools, are looking to pay less than what they would normally pay a person who’s applied directly to them. This is a big kicker for new graduates, many of us think “Well, I did just get out of school… so $10/hr isn’t so bad I guess….” NO, wrong! Stop this mentality, stop it! You’ve just finish a college level course, took out loans, borrowed money, invested many hours into graduating and you deserve the pay that you feel you should get if your work is great. Never under appreciate yourself as a designer. Nothing wrong with looking at other portfolios, especially if you’ve never created one before. I scoured the web looking at online portfolios, every where imaginable. There are many out there, many beautiful, some not so much. Just keep in mind, you’re selling yourself as a designer/coder/programmer so make it interesting. 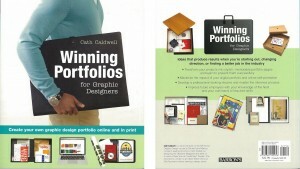 I picked up the book, “Winning Portfolios for Graphic Designers” by Cath Caldwell. Fantastic book! It covers everything from; presentation bag, preparation, going over past artwork, online presence, and self promotion. I would suggest picking up this book, if you’re really serious about creating a proper portfolio. Keep a list of all the companies you’ve submitted your work to, give them 4-5 days to look over everything (we’re busy people and time is impertinent to us), then call them to follow up. Companies will love this, it shows you’re on the ball, take initiative and are pro-active. They are going to be days when you just stare at the phone, repeatedly look at your email and wonder why no one has called you. Keep working on finding work, keep creating designs for your portfolio, keep your networks open.